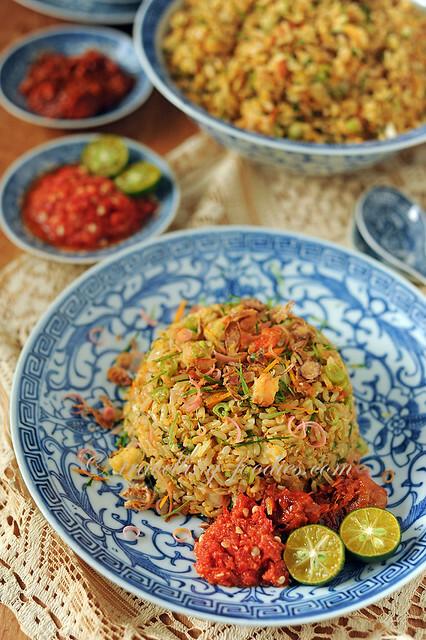 Nasi Ulam, or pronounced as “nasik ulam” in Baba Malay is a classic Peranakan dish which has its roots in Southeast Asian cooking. 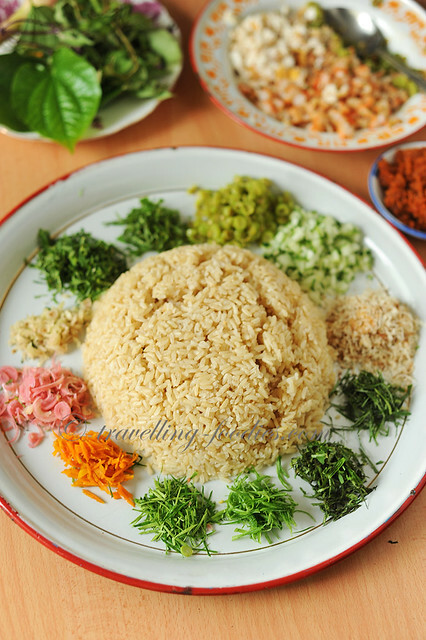 Comprising of essentially a variety of chiffonaded herbs tossed in steamed fragrant rice, it is painstaking to prepare and thus usually served on “ari besair” during weddings, birthdays or other celebratory events. 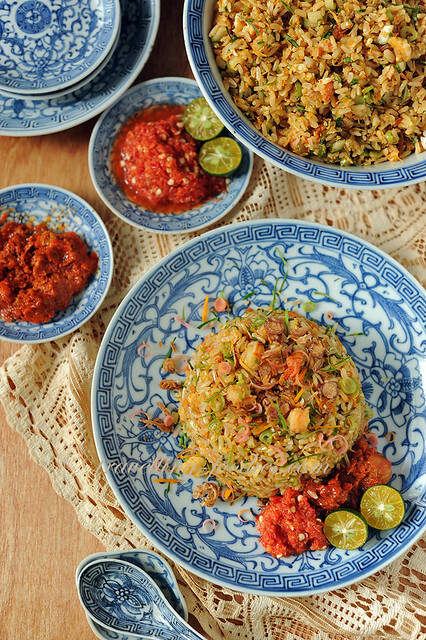 The true art in the preparation of “nasi ulam” lies not only in the choice of herbs and ingredients to use but more importantly the “mise en place“. Firstly, the selection of the leaves is important, making sure that every blade is fresh and free of blemishes. If a lighter and more refreshing taste is preferred, young and tender leaves or shoots can be chosen but if one should desires stronger and more robust flavours on the palate, more matured and fully grown leaves can be plucked. In any case the leaves should not look “old and tired” and of course brown or wilted ones are a big no no. Each herb must be “iris alus” i.e. sliced so finely so that the final dish would look very refined or in Baba Malay, “senonoh“. The leaves of some herbs should be stacked before slicing while others need to be rolled before chiffonading. While all leaves need to have their stems and stalks removed, “tougher fellas” like kaffir lime leaves aka “daon lemo purot” need to have their fibrous midrib veins pulled out before being sliced or it would affect the palate sensation in the end. Apart from the herbal concoction, other vegetables are also used to lend texture and crunch. 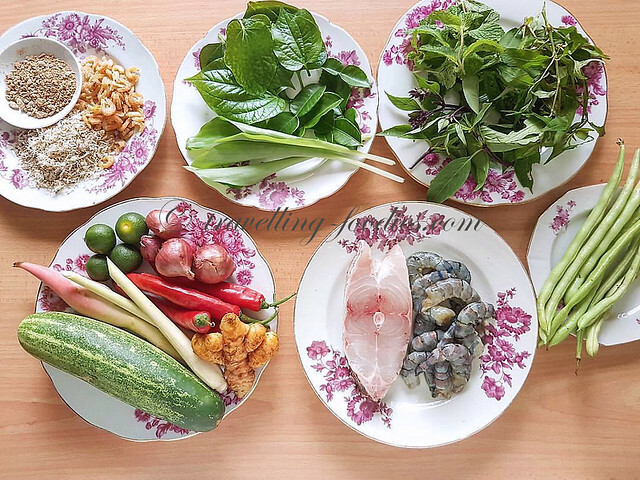 The common ones would be timun (cucumber), sayor kachang (long beans) or even kachang botol (winged beans). I prefer kachang pranchis (french beans) over snake beans as the former has a delightful crunch to it. While the cucumber are brunoised i.e cut into very small cubes, the beans are sliced into thin rings and panfried quickly to rid them of rawness. Winged beans however can be briefly blanched or simply eaten raw. For some folks, the rempah titek, udang kering and kerisik are kept separate but I like to prepare the rempah titek into a sambal tumis before adding dried shrimp floss to become sambal udang kering aka hae bee hiam and then tossed with part of the kerisik to become an enriched serondeng. This is done first and set aside to cool down before getting on with the remaining ingredients. While the steamed rice is left to cool, the tedious mise en place of all the other ingredients begins. It is important for all the ingredients to be at room temperature before tossing everything into a mixture as heat can cause the herbs to turn black or taste bitter. After that, it is just a case of getting everything into a mixing bowl and toss away! Place the rinsed rice into a pot and pour water over to completely submerged. Let the grains steep for 20-30 min. Add salt and stir well. Place pandan leaf bundle over the rice. Bring to a boil before lowering the flame and let it continue to cook under very very low heat until the grains are fully cooked and significantly dry. Set aside to cool down before using. Remove the stalks of all the ulam leaves, as well as the midrib of kaffir lime leaves. Thinly slice all the leaves and peeled turmeric root into very narrow strips. Slice the torch ginger bud, french beans and lemon grass into very very thin rings. To a heated wok, add cooking oil and fry the rempah titek paste with sambal belacan powder until fragrant and oil begins to separate. Add dried shrimp floss and saute until aromatic to form sambal udang kering. Add kerisik and mix well to homogenise. Drain off excess oil and set aside to cool down. To a heated wok, pan fry fish until both sides turn golden brown and the insides are cooked. Remove and set aside to cool down. Remove skin and flake into small pieces. If using, cut the salted fish into small cubes and lightly saute until slightly brown and crisp. Remove and set aside to cool down. To the same wok, lightly saute the sliced french beans from “ulam ingredients” very briefly just to remove the “rawness”. Remove and set aside to cool down. To make sambal belacan, pound or blend the red chilies with toasted belacan powder. Shredded kaffir lime leaves may also be added for extra zing. Adjust with a bit of salt. Add calamansi lime juice and mix well to incorporate. To assemble, first ensure that all the ingredients are at room temperature. 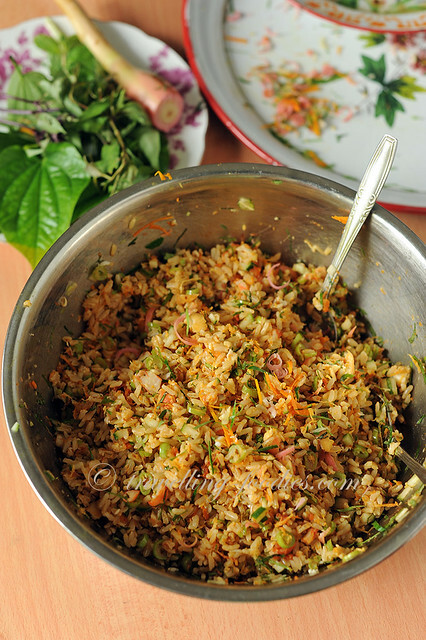 To a large mixing bowl, add cooked rice followed by the sambal tumis. 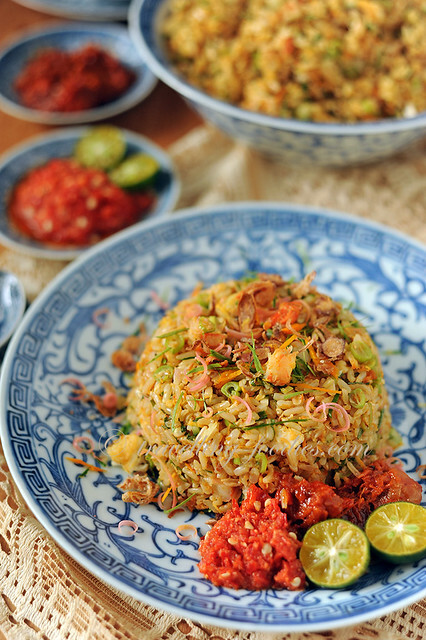 Fluff the rice with two forks or by hand until every grain is evenly coated and coloured by the sambal tumis. Add in all the sliced ulam ingredients as well as cooked ingredients i.e. shrimp, fish, french beans and toss to mix everything together uniformly. Dish up to serve and garnish with more sliced ulam ingredients, kerisik, fried shallot or garlic slices. Serve alongside with sambal belacan, and for my case, Nyonya Guek’s aceir ikan asin. This entry was posted on November 7, 2017 by Alan (travellingfoodies). 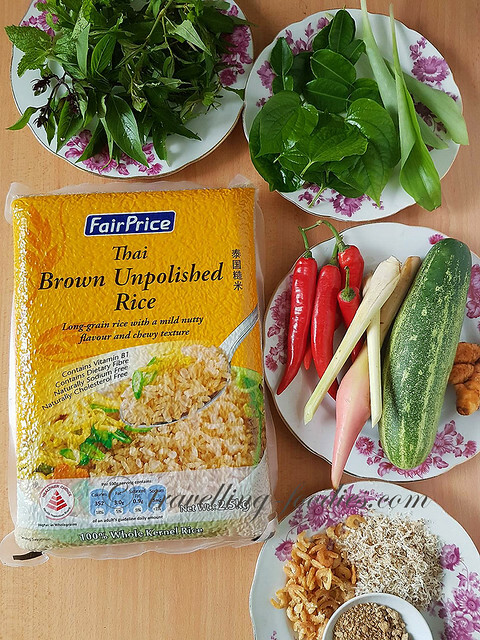 It was filed under Food, Simple Eats and was tagged with asian, herbal mixed rice, herbs, nasi ulam, Nyonya, Peranakan, sambal belacan, straits chinese.